A beautiful guided meditation audio to promote self healing and spiritual awakening through chakra balancing, color healing, positive thinking affirmations and visualisation techniques. Includes a wonderful feel-good endorphins raising meditation. This meditation CD is recommended for anyone interested in self healing and spiritual meditation. 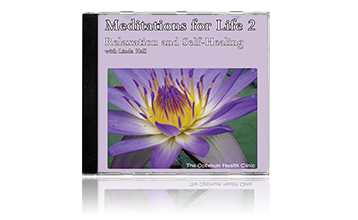 Meditation for Life 2 offers three very special nourishing and uplifting meditations to promote self healing and spiritual wakening. If you’re looking to broaden your experience of meditation and work with yourself at a deeper level, this enriching guided meditation CD is a perfect introduction. It aims to induce deep states of inner peace and self healing, and includes a powerful chakra balancing exercise to balance body, mind and spirit and restore inner harmony.The spiritual meditation in this guided meditation CD draws on a rich tradition in self healing and inner growth. It’s not necessary to be aligned with any particular belief system or religion, all that’s needed is an open mind and to let the relaxing meditations do the work for you. Color healing and endorphins raising meditations are tried and tested ways to bring about desired states of well-being. Chakra balancing fuses ancient meditation philosophy with modern psychology. Positive thinking and positive affirmations are now recognised by mainstream health care as a powerful means to support health and well-being. 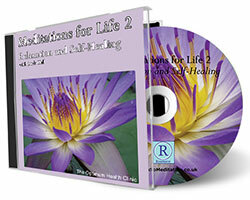 Meditations for Life 2 brings all these powerful self healing modalities together in one meditation CD. *Chakras are ‘subtle energy’ centres closely related to our health and well-being and self-development. Meditating on the chakras helps them to re-balance, and supports us to move towards healing.